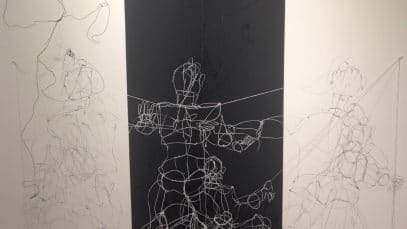 But although those two works will immediately engage you as you enter, the rest of the space will pull you away to interact with the smaller, more detailed and intricate pieces. Whether you read all the text, or some of it on multiple visits — or enjoy it as mark making you needn’t decipher — is up to you. Some are reminiscent of book page layouts: others play with fonts and text in a way more graphic than typeset (The Ravenous Beasts At Fairy Godmothers House are white scratchy words on black, bracketing above and below a sketch of the named house), and words “speak” in scribbly scrabbly ways, or in more insistent, detailed and tiny tidy insistent forms. Some works are cruciform in shape, furthering the planes in which text and image meet and meld or meander around and with each other. The titles betray a wry humour: Ms. Smith Is Hard Put To Explain To Her Husband How She Came To Spend The Night Unexpectedly in Phillip’s Nightgown is one. Other evocative titles that hook you in: Comma Fucked, or Those Lousy Pessimists Sometimes Make a Guy So Blue All He Wants to Do Is Run Amuck, or Sullenness in Machines in Advance of Outright Rage. I suspect these are speaking directly to me, but that’s a consistent quality of good artwork, to reach out in that manner. Fiction’s conception was this: “Tony Calzetta [painter, draughtsman and printmaker recently relocated to Welland] and his printmaker friend Dieter Grund … were looking for a project they could work on together. Tony suggested they collaborate with … [Toronto based Governor-General Award winning novelist, poet and painter] Leon Rooke to produce a limited edition livre d’artist [artist’s book, but that’s almost too confining a term]… instead of the customary practice of the artist illustrating the writer’s text, they would approach the Fabulous Fictions project the other way round. Tony presented Leon with a number of small drawings [and he] wrote sketches for nineteen of the images, which artist and author then winnowed down to a select nine ‘Fabulous Fictions’. Tony reworked the original drawings and combined them with Leon’s texts and media that included intaglio, woodcut and digital printing. In addition, one of the drawings and its text, ‘How God Talks in His Sleep’, was reimagined as an interactive paper sculpture and attached to the front of the slipcase.” (that comes from the notes from The Porcupine’s Quill publisher, Tim Inkster, and it’s worth considering the intersection of how this project is part of GPAG’s annual spring celebration of the book arts, which is a wonderfully fluid and fun area, that many artists reconfigure playfully. This year, Waygooze 2017 continues this nearly four decade long tradition; by the time you read this, the April 29 event will have passed, but anthologies of the contributors from this year, and the past years, are available).